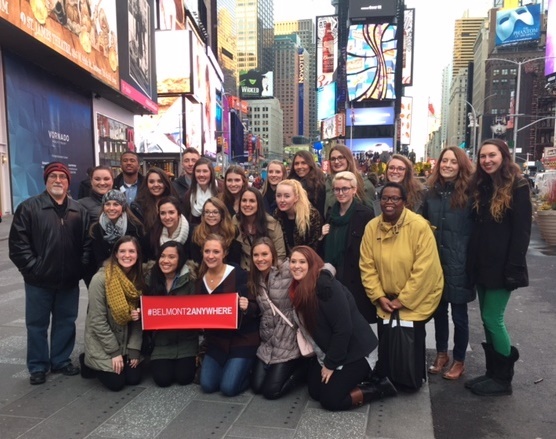 Belmont psychology and neuroscience students recently attended and presented research at the annual meeting of the Eastern Psychological Association (EPA) in New York City. The EPA was founded in 1896 and is the oldest of the regional psychological associations in the United States. Jasmine Jarupat, Belmont psychology alumna and current University of Oregon psychology graduate student, joined the group. Psychology faculty attending the conference were Drs. Lauren Gilbert, Linda Jones and Lonnie Yandell. Participating students included Alex Gumucio, Morgan Turner, Samantha Gould, Justin Lang, Madlin Lausten, Katy Coffer, Kathryn Hook, Jacob Huffman, Mallory McDonald, Amber Lowe, Ashton Judy, Kayla Evans, Brittany Yeager, Kathryn Graeff, Emily Gildea, Blair Ferguson, Margaret Rittler, Julisa Nunez, Lauren Weaver, Scarlet Sanders and Bee Strother.